It's time...I'm tired of waiting. The 4th of July is coming up and that signals the middle of summer to me. Therefore, I took it upon myself to declare that it is time to put up my summer/July 4th decor regardless of the weather outside. Unpack those boxes in your garage and make your home look a little more summer-y too. It will make you feel happier. I guarantee it. We like to decorate with things that our family has collected throughout the years...it provides us with little glimpses down memory lane. We like to decorate our home with a little beachy/seashore flavor. This little guy is in my bathroom. I love this fish pillow in my family room. It makes me want to swim in the ocean. 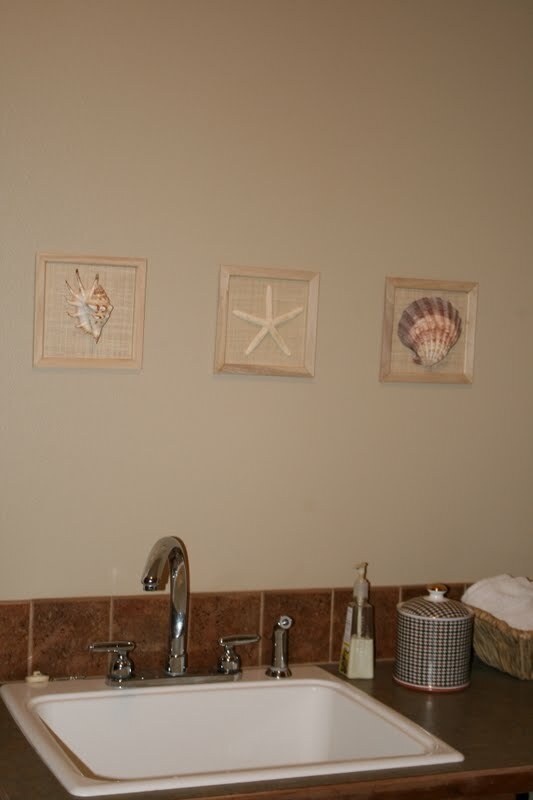 I place seashells throughout my home. This one is on my mantle. This star fish is on my coffee table. My son insisted we buy it...he named it Patrick. I like to add light colors like this white vase and yellow bamboo plate. I changed the planter too. These are on my armoire. They make me happy. This picture and shell box are in the formal living room. I topped it with a real shell. A picture of coral and a shell my son got in Puerto Vallarta. He really had to bargain with the shop keeper to get it for 6 bucks. I love this candle holder. I got the huge glass container at Marshalls. I added sand (from our sand box), a huge pillar candle and real shells. The sand dollar was a gift from our friends for Christmas...thanks Caporales! I keep this on our dining room table. This is in my laundry room...looks like the starfish is a little crooked. On our patio...we carried the theme throughout our home. I got these pillows at Pottery Barn last year. This is one of my favorite places. I love to just sit out on the patio and watch the kids play in the yard. Let's not forget Independence day. This is inside our armoire. A little nod to the flag. In our entry way. I love to bring in a little Americana this time of year. Coming up soon, a wreath and "fireworks" to give your friends to celebrate July 4th. 1 Response to "Summer and the 4th of July"